Apple's newest entry-level Mac recently received a full hardware makeover, with a wider but flatter aluminum unibody shell, integrated power supply, built in HDMI for home theater applications, and a greener more efficient design. The redesigned Mac mini continues to hold down the low end of both Apple's desktop offerings and server products, shipping in both a standard version equipped with an optical drive and one 320GB hard disk, or alternatively a server model that drops the optical drive and its slot to make way for two 500GB hard disks. Apple markets the Mac mini as being a convenient, compact replacement for an existing PC. It sits a step or two behind the mainstream iMac all-in-one system, and is not even close to the professional market Apple targets with the Mac Pro. In its server configuration, the Mac mini is similarly a long ways from the high end Xserve product line. In terms of performance, the standard Mac mini is built with the same general architecture as the entry level 2010 MacBooks: a 2.4 GHz "P8600" Intel Core 2 Duo processor paired with NVIDIA's GeForce 320M graphics chip. The previous Mac mini paired a Core 2 Duo CPU with NVIDIA's GeForce 9400M, just like last year's MacBooks and the current low end iMac. The server version ships with a slightly faster 2.66 GHz "P8800" Intel Core 2 Duo and the same graphics hardware; the standard version can also be upgraded to that same CPU for $150 more. 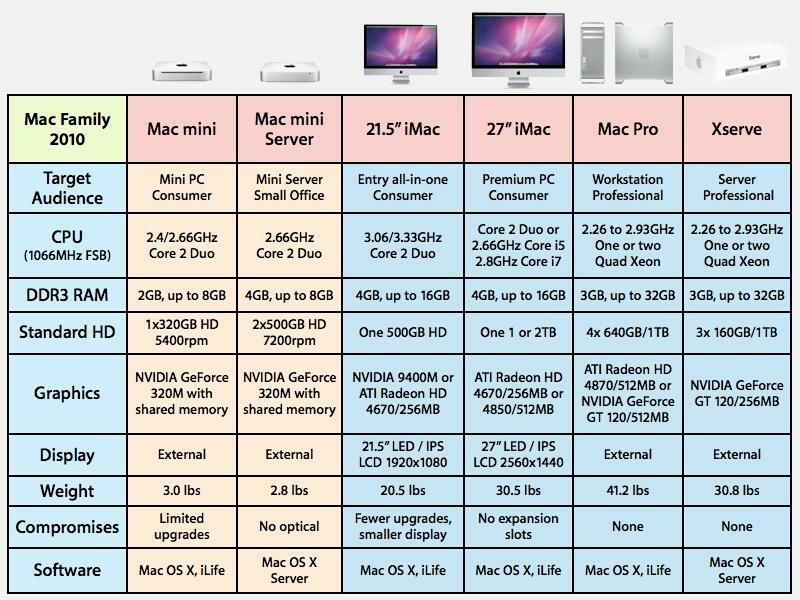 Apple's higher end MacBook Pros and iMacs use an Arrandale (mobile) or Lynnfield (desktop) Core i5 or i7 CPU (both use the Nehalem microarchitecture rather than the earlier Core). Intel's mobile Arrandale processor packs its own Intel HD Graphics, which Apple augments with a GeForce GT 320M, which kicks in when necessary. That chip is faster than the graphics chip in the Mac mini, and also has its own dedicated 256MB of graphics memory rather than just sharing system RAM as the Mac mini's graphic chip does. Like the MacBook and the low end of both Apple's MacBook Pro and iMac line, the Mac mini continues to use Intel's Core 2 Duo paired with NVIDIA's "graphics chip plus chipset." This architecture supports a lower overall cost while still providing decent performance very competitive to the entry level Nehalem Core i3, and much faster than alternative, low end Windows PC CPU designs including Intel's very low end Atom or AMD's low price Athlon X2 options (see next page comparisons). Still, the Mac mini is now priced higher, with the standard model with 2GB of RAM starting at $699 and the server version with 4GB of RAM beginning at $999. Both can be expanded to 8GB, although Apple's own maximum memory upgrade costs a whopping $500 extra.